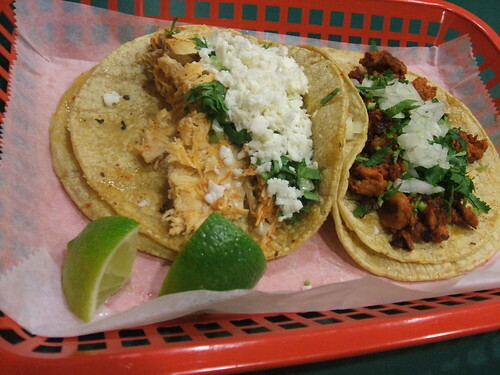 In a word: A pair of star-crossed taquerias make their fare. JM ate the chicken nachos with a fountain drink. Marijka ate the chile relleno with an horchata. 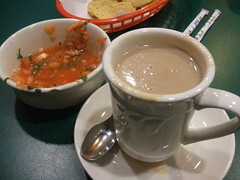 Nichole ate a chorizo sope, a cheese (i.e., chicken) quesadilla, and a champurrado. Ryan ate two tacos with an horchata. The bill was about $10/person, plus tip. Nichole and Ryan gave Los Gemelos an A; Marijka gave Los Gemelos an A-; JM gave Los Gemelos a B+ (see our grading rubric). Los Gemelos ("The Twins"), originally a grocery on Odana Rd., lived up to its name and caught some long-deserved attention when it opened a second location on State Street. Before we get flak for pulling an odious "we liked their earlier stuff" bluff, we'll admit to never having set foot in the grocery before reading about it in 77 Square. We'd rather get flak for cheating on the List because that's exactly what we did, stopping in for some groceries, dinner and a beso on a hot summer night long before it was Los Gemelos' turn. No lamentamos nada. For our "official" visit, we picked dinner at the downtown location. The menus are similar at both. The service was fast downtown, which made Ryan think Los Gemelos would be an ideal between-movie destination for Film Fest week. We were served the customary basket of chips with homemade salsas. The chips were warm and salted, but just a bit stale, as if they'd been made yesterday from the day-before-yesterday's tortillas. Exceptionally flavorful. Whether that's because someone doubled the amount of powdered drink mix or the result of a homemade beverage carefully created I can't say. 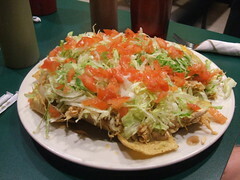 JM's nachos with chicken were heavy, wet, and loaded with shredded lettuce and diced tomatoes. 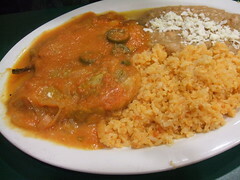 Marijka's chile relleno was battered, fried and smothered in tomato sauce with a few jalapeño slices. It tasted good, and was quite saucy and puffy. The beans and rice were fine but filler. Nichole and Ryan mixed and matched some antojitos, all of which were $3 or less. A sope came on a deep-fried, crisp oval of corn just slightly thicker than a tortilla, topped with chorizo, cheese, lettuce, tomatoes, and sliced avocado. The double soft corn tortilla, garnished with chopped onion and cilantro, is the type of taco that makes my heart beat ever so slightly fonder. Bravo to Los Gemelos for serving them that way, and with what felt and tasted like especially fresh, soft tortillas. We were all impressed. Our companions reported that they were also inspired to check out the grocery. They noted that the brand of tortillas from Chicago is the same as what they normally buy, but the grocery also had bags of fresh masa. We wondered if Los Gemelos makes their own tortillas to serve in the restaurant. We should go back and ask. Best tacos downtown, in my opinion. Great spot for a fast, inexpensive lunch. Best tacos in Madison. I've tried every kind they offer and they're all great. Eat here often. Oh -- and everything is house-made, including the tortillas. Ate here for the first time for lunch today. Very nice. Great chips and salsa. Steak taco - very nice. Tasty homemade soft tortillas and nice jucy, well-seasoned, chopped up bits of steak. I also ordered a chicken sope. The ingredents were fresh and as described above. Special mention to the thick slices of fresh avacado that topped the creation. 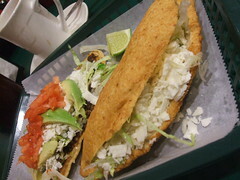 The main difference with this sope than say, Taqueria Guadalajara, is that the tortilla here is much firmer. It almost seems like it was baked. That makes it hard to cut so, unless you want to totally destroy it, you have to eat it like a giant nacho chip. It was great. Good tasting, filling lunch for $5. Can't bear that downtown. I took my wife to Los Gemelos for supper after a hard evening of protesting up on the square. My wife loves chips and salsa, and I raved about Los Gemelos chips on the walk down from the square, which, as opposed to what you guys experienced, were fresh, crisp, and delicious when I was there for lunch. So, we sit down, look over the menu, order our food and after awhile realize there are no chips and salsa coming. When I asked the waitress about it, she informed us that they don't serve chips and salsa after lunchtime. We were crushed. Part of the fun of eating at a Mexican restaurant is the immediate gratification of being presented with a nice big basket of chips to munch on when looking over the menu. Even better if accompianed by a cold bottle of cerveza. I mentioned our shock and dismay to the waitress hoping she might pass it on. I do have to say, by the end of the meal, which was every bit as good as remembered, we were very well satified. Leaving the restaurant we agreed we'd definitely be coming back there again. But, perhaps, next time for lunch. Just want to reaffirm that this is an affordable and wonderful place. I've been here so many times now that I can't even count, and every time I'm impressed with the sear on the meat and the red and green salsas. They're extremely consistent, make their own tortillas, and for what it's worth, to Timmy they're a Taqueria comparable to the best I've visited in Milwaukee or Chicago.